Pre-cast concrete has become one of the most popular choices when it comes to the construction of modern buildings today. It is not only considered strong but also shortens the time required for construction. Pre-cast concrete is also advertised as a great solution if you want to avoid water seepage problems in the long run. This is because it is a continuous concrete block. This minimizes the spaces through which water can penetrate. This doesn’t mean that using pre-cast concrete automatically prevents seepage problems in the long run. Seepage problems can still occur especially if there are structural failures in the pre-cast concrete that may occur during the construction phase. The concrete sections have to be properly sealed in order to form the foundation. This is one of the most crucial steps in the installation of the concrete slabs. However, there are occasions when these slabs are not sealed properly. This results in leaks and seepage. The alignment of the concrete blocks is vital for their fitting. Good alignment will result in better sealing of the sections. Poor alignment especially in the corners of the foundation will result in water seepage in the spaces that result. 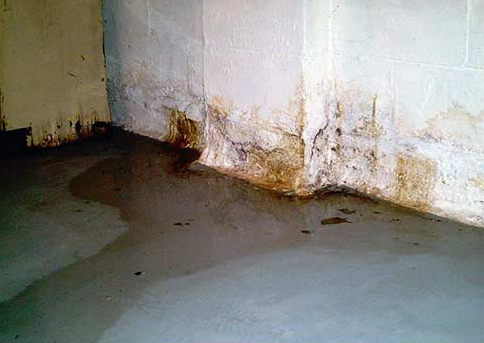 Inadequate footing drainage will result in seepage and flooding of the foundation. Water will seep through the bottom of the wall and up over the slab into the basement. This occurs at the joint between the wall and the slab. Installing an adequate drainage system at the footings is vital in preventing the flooding. It is important to ensure that the concrete slabs don’t span excessively without footings of fillings. This leaves a long unsupported section that is vulnerable to settlement, leaks as well as foundation movement. The concrete sections should not span more than five feet without a footing or filling. If your foundation is leaking and was constructed using pre-cast concrete, consider having an internal French drain installed. This may require some form of adaptation of the drainage system. This is because the installation of a regular drain would require cutting into the slab. This would result in the exposure of the gravel footings and subsequent leaking. It is therefore important to get in touch with a foundation contractor and have them adapt a drainage solution for your particular situation for long term protection of your foundation.